→FAST FACTS: Who invented the Philippine terno? 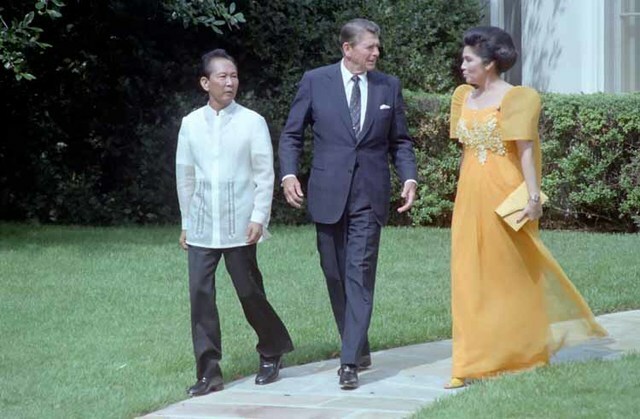 MANILA, Philippines – Former first lady Imelda Marcos was well known for donning the terno and its famous butterfly sleeves during the ’70s, but the controversial “Iron Butterfly”, as she was then called, did not invent the traditional Filipiniana dress. Questions on the terno’s origins cropped up on Thursday, January 26, after Miss Philippines Maxine Medina wrongly attributed the invention of the terno to Mrs Marcos, wife of the late dictator Ferdinand Marcos. 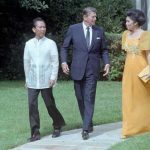 Marcos indeed made the terno famous, as it was her dress of choice worn to state events and functions when she was first lady. But the terno, which evolved from earlier traditional Filipino dresses like the baro’t saya, the Traje de Mestiza, and the Balintawak, has long been worn by Filipino women years before. The meaning of the word “terno” was also different back then. The word “terno” means “matching,” and was used in the 1920s to refer to a matching set of camisa, pañuelo, and saya. “She was so closely associated with the terno that the following administration obviously didn’t help by sort of condemning it and wearing the kimona, which is basically a baro’t saya with no sleeves. It’s much easier to make,” Higgins said in a 2016 interview with CNN Philippines. One of the most well known designers of the terno was Ramon Valera, National Artist for Fashion Design. He was credited for giving the country “its visual icon to the world” via the terno. “In the early 40s, Valera produced a single piece of clothing from a four-piece ensemble consisting of a blouse, skirt, overskirt, and long scarf. He unified the components of the baro’t saya into a single dress with exaggerated bell sleeves, cinched at the waist, grazing the ankle, and zipped up at the back,” the National Commission for Culture and the Arts (NCCA) said in a description of Valera on its website. “Valera constructed the terno’s butterfly sleeves, giving them a solid, built-in but hidden support. To the world, the butterfly sleeves became the terno’s defining feature,” it added. “No one person invented it. It was a collective effort. The removal of the pañuelo, which is usually attributed to Valera, happened way, way before [he removed it]. Women have been trying to remove it way before,” Gonzales said in a 2015 interview with the Philippine Daily Inquirer.